With British Science Week upon us, the sets from Wild! Science are perfect for children to experiment with various things and come up with some fun creations. We’ve been trying out the Wild! Science Cake Soap Factory and I’m amazed at some of the fun edible looking soaps Miss M has come up with. If you do try out one of the Wild! Science kits then be sure to keep your receipt as there is a chance to win a fabulous competition to Orlando Florida! The set includes everything you need to make the soaps from transparent soap blocks, pigment soap blocks, colours, stirring sticks, glitter, 2 plastic measuring beakers, piping bag & nozzles and of course a cake shaped mould tray. 9yr old Miss M was eager to get started and we found the instructions simple to follow and carry out. You simply put various amounts of blocks of glycerine soap and pigment into a beaker and melt it in the microwave. Once in liquid form you can add drops of colouring and stir in, then before it turns to a solid again, quickly pour it into the moulds to set. We repeated this process several times making different colours and multiple cake pieces. Miss M’s favourite part was whisking up some water with liquid soap to form a foamy soap which can be piped between or on top of cakes to represent cream. This was great fun but you have to work quickly before it sets. Aren’t the finished soaps beautiful? In fact we think they look good enough to eat although of course they won’t be very tasty! The Wild! Science Cake Soap Factory is a fantastic educational set in which you can experiment with liquids and solids. It is fun to use and has been thoroughly enjoyed by my 9yr old who can’t wait to use her new soaps in the bath and shower. Valentine’s cupcakes topped with Double Chocolate Fudge from The Devon Fudge Company are the perfect indulgence for this time of year. Enjoyed by couples, families and kids alike, it doesn’t matter who you make them for, you know they have a versatile appeal and if you have kids they can be part of your Valentine’s celebrations. For simplicity I just used the basic sponge recipe my mum taught me many years ago when I first started baking, 2 ounces of butter, sugar and flour to each egg. This is a simple one for kids to follow too and my two love mixing it up in a bowl for me with a wooden spoon (whereas it’d be straight in my stand mixer if I was doing it!). Simply cream the butter and sugar together before slowly adding the beaten eggs, then fold the flour in to make a rich, chocolately batter. Simply beat all the ingredients together, pipe on top of each cake and then decorate as you like, obviously here we have added small chunks of the utterly delicious Double Chocolate Fudge from The Devon Fudge Company along with some small pink chocolate hearts to add to the feel of upcoming Valentine’s Day. The Devon Fudge tastes utterly delicious. We did taste test it before adding it to the cakes and didn’t want to lose the flavour in the cakes so put the pieces on top. As you bite down into the cake you really taste the fudge in the icing and it makes a delicous addition to what otherwise would be a standard chocolate cake. For a quick a simple homemade treat this Valentine’s why not make a batch of these cupcakes and don’t forget to add some Devon Fudge for that extra special touch and flavour! I think one kitchen gadget that most people would love to own if they don’t already is a stand mixer. They look great and are fantastic for a multitude of baking scenarios from beating, whisking and kneading dough. Savisto is not a brand I’d heard much about before but am excited to try out their Retro Food Stand Mixer which retails for under £100 which is an amazing price for what you get. The Stand Mixer comes with three attachments, a transparent lid and a silicone spatula. The large stainless steel bowl has an impressive capacity of 5.5 litres, is ultra light to carry and has a chunky handle that’s easy to grab hold off. It looks fantastic and I know I will fit whatever quantity of mixture I want to make up in it. The whole stand mixer has a stylish look and a smooth, curvy structure which is easy to wipe down after use. It may look impressive and stylish, but the big question is how easy is it to use and how well does it work? So with my little boy Mister B’s 6th birthday party on it’s way I got started on a basic cake batter. Being a little unsure on how the mixer would perform, I made my first batch with just four eggs but having done that you could easily fit a batter double the size in the huge bowl! Each of the three blades simply fits on with a push and twist. It’s so easy that you can chop and change if required. Also if you want the lid on you need to click that into place before the blade attachment. Below you can see me creaming the butter and sugar together, the finished chocolate cake batter, and mixing up a minion yellow coloured buttercream to top the baked sponges with. Once your attachment is in place simply turn the lever to release it back down into the bowl and add your ingredients. Mixing was an absolute dream, just turn the dial to the required number (you have six speed options) and off it goes. It works really efficiently and is a total pleasure to use. I split my first batch of cake batter into two tins for two layers of the main birthday cake. Later I made a third layer and multiple cupcakes in various sizes. I ended up making several batches of cake batter plus a couple of batches of buttercream which I couldn’t have done in the time without the ease of the Savisto Stand Mixer. It’s quick, efficient and the bowl is so easy to scoop the mixture out of and wash up! A huge bonus from the clunky, 16yr old food processor I have been using to do my baking up to now. The bowl is large and smooth making it so simple to clean, if you are changing what you are mixing, you can easily wash it out in a couple of minutes and use again. With a multitude of cakes made it was time to decorate which took me way into the late hours but fortunately the birthday boy was thrilled with the results just like I was thrilled with the pleasure of using the Savisto Retro Food Stand Mixer. When a gadget is easy to use it always makes life simpler and means it’s something that you will use again and again. I can’t emphasise how simple this stand mixer is, you just click the bowl and required attachment into place, then turn it on to one of six speed settings. Et Voilà! A cake is made! I’m very impressed with Savisto, for the both the price and style. They sell a range of kitchen gadgets so do check them out and see what they have. There’s probably something on there that would make a great Christmas gift and I can certainly say that I recommend the stand mixer for any keen bakers out there. I fancy trying a meringue based recipe next with my new Savisto Stand Mixer to try out the whisk attachment, so keep your eyes peeled as I’ll share my results in a future blog post! Sugar and Crumbs sell an amazing range of naturally flavoured icing sugars and cocoa powders with intense bursts of flavour from using 100% natural fruit. My first thoughts on the ready flavoured sugars was how fantastic, no messing around trying to flavour the icing yourself, it’s all done for you. I did wonder how they’d taste so couldn’t wait to try them out. I was sent a Chocolate Orange cocoa powder and icing sugars in Tropical, Lemon Drizzle and Velvet Vanilla. The packets were a delightful hot pink colourful with resealable tops which I think are a great idea, really convenient and easy to use. 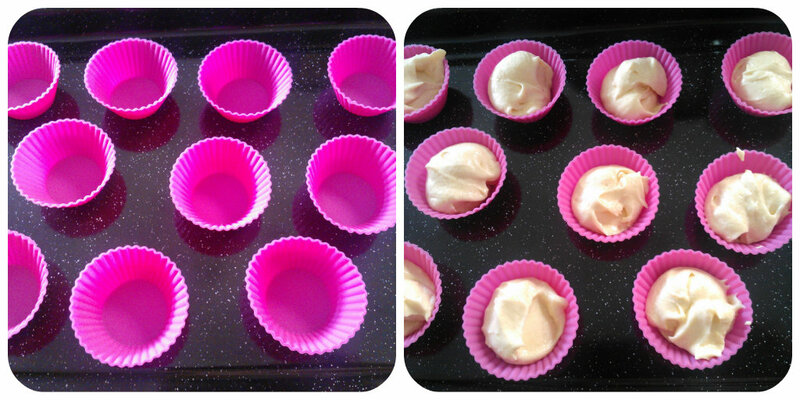 Eager to try out the different flavours I decided to make some mini cupcakes in both plain and using the chocolate orange cocoa powder so that I could add the different flavoured icing sugars to the top and try various combinations. Sugar and Crumbs kindly sent me a basic sponge recipe to use the cocoa powder with and an instruction sheet as to how to use their icing sugars. They have cleverly made their icing sugars with really intense flavours allowing you to adjust them by diluting with plain icing sugar to reach a level that suits you. Also each packet will last longer if you don’t use them to their full intensity. 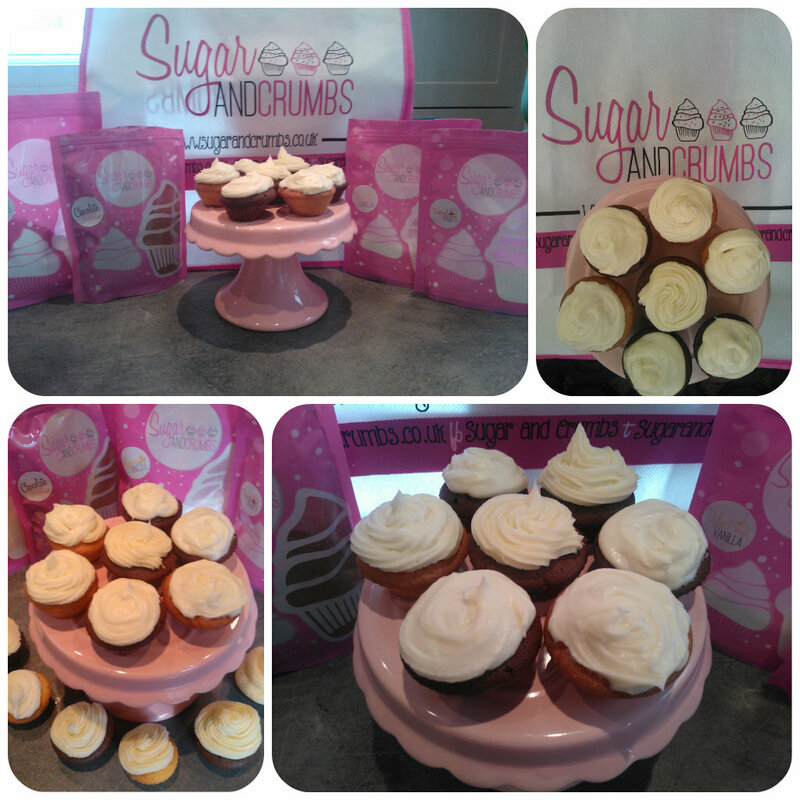 The flavoured products from Sugar and Crumbs are so simple to use, simply exchange them for your plain ingredients and you have flavoured cakes with no effort at all. So what did we think of the taste? The Chocolate Orange cocoa powder was very intense but a true, fresh orangey flavour burst came through the chocolate. This is definitely one that can be used at a lower strength which I would next time. The Velvet Vanilla icing sugar was sweet and full of vanilla flavour as I would expect it to taste. My children enjoyed this one and it was their favourite of the flavours we tried. My first choice would go to the Lemon Drizzle with it’s rich lemon flavours, which tasted fresh and citrusy. Knowing my husband enjoys tropical flavours I gave him a cake covered in Tropical flavoured icing – he didn’t know what he was about to taste and thought I had just made plain cakes. 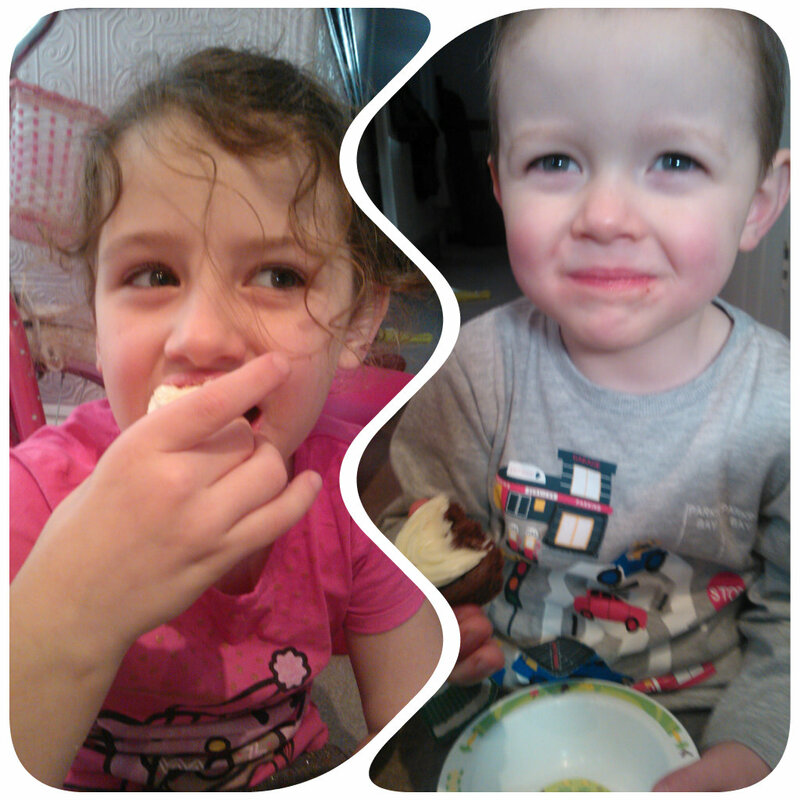 I didn’t expect such a strong reaction from him, but after his first bite he said “Oh wow, that is lush! !” and then proceeded to ask me when I was going to make some more. I think that in itself speaks volumes about the rich intensity and deliciousness of these ingredients and the flavours that they bring to baking. 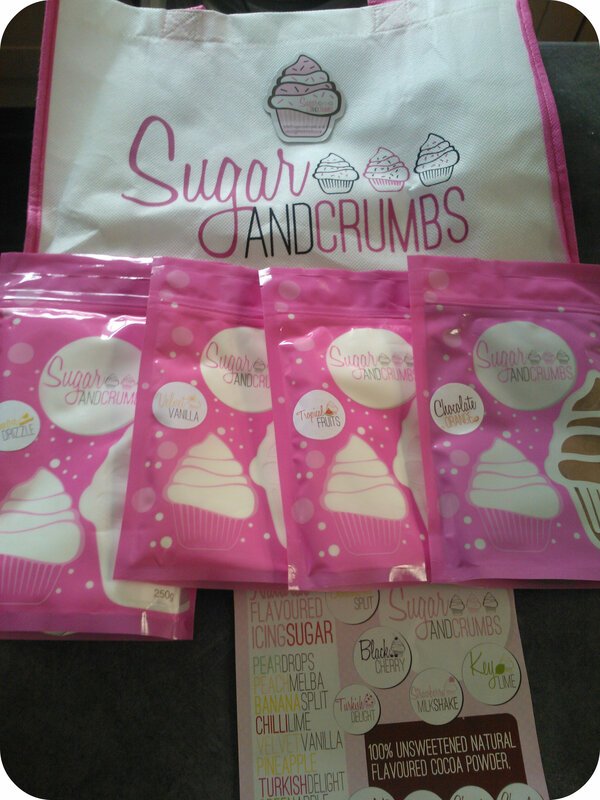 We’ve enjoyed baking with flavoured products from the Sugar and Crumbs range and would definitely recommend them to anyone looking to bring some flavour to their cakes. Sugar and Crumbs have a wide variety of flavours available and one that has caught my eye is Chocolate Lime while my husband has his eye on the Turkish flavoured icing. Why don’t you take a look and see what flavours you would enjoy?